You just may be the master of infrastructure. 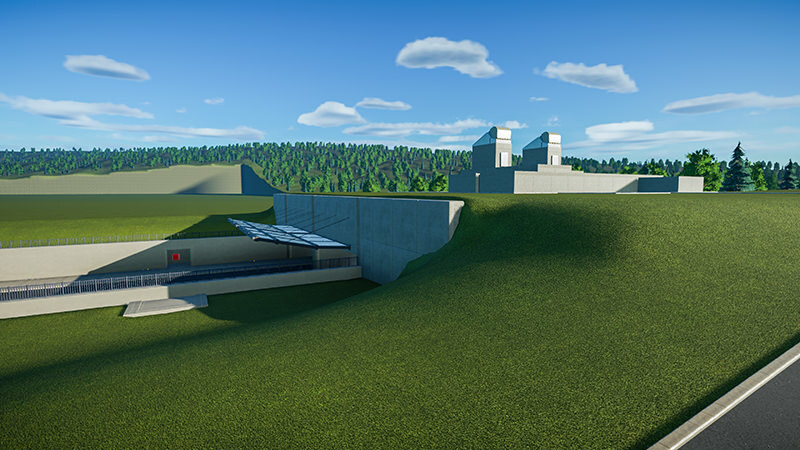 This project might be a good one to save as a blank template for people to build parks on. The Tunnel now has beautiful concrete panels at the front. 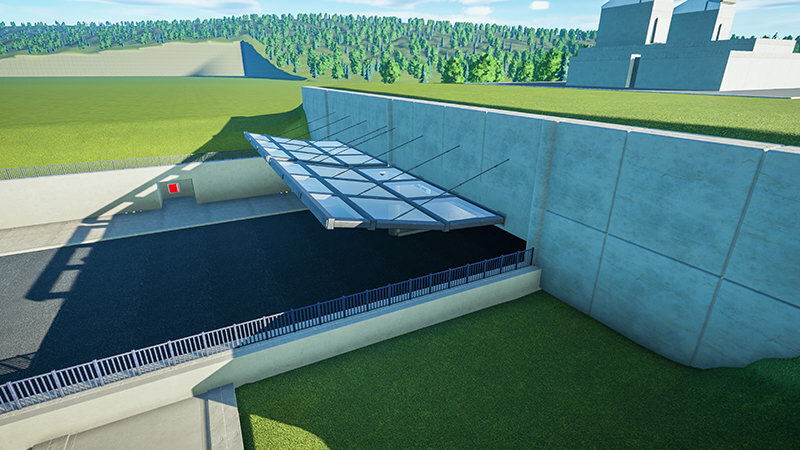 The emergency exit is located on both sides of the tunnel. You will also see the fire hose cabinet. I think I should raise this a bit because I think it's too low. In the US, it's no longer legal to put fire hose in cabinets as that encourages untrained civilians to stay in the danger zone to fight the fire even if they can't tell the fire is too serious or the wrong kind for the hose in the cabinet. When it was the custom to install hose cabinets, most of the civilians had served in WW2 or Korea so they knew what to do in emergencies. But nowadays, most civilians have no clue so it's best just to get them out of harm's way, for their own good. Besides, would you trust your life to a piece of hose that's been hanging on hooks and dry-rotting for decades without ever being tested? That said, NFPA 10 still requires fire extinguishers in all commercial buildings, of a size and number dependent on the fire load in the area. And NFPA 10 also says how high the extinguishers have to be mounted above floor level, which depends on the weight of the extinguisher. Thank you. I will have to think about that because it is also my YouTube park. In the Netherlands, very strict requirements are set for fire safety in tunnels. It is even stricter than European legislation. The fire hose reel and fire extinguisher is more intended for a small fire. The connection point for the fire brigade is also located in the cabinet. People get help with fire from the control room throughout speakers in the tunnel. The fire is also monitored by sensors and cameras. When the fire gets worse, then the tunnel will be evacuated. In the meantime, the fire brigade has also been alerted, They have a driving time of up to 15 minutes. Several fire stations in the fire brigade region are also called to support, or the fire station is supplemented by fire engines, These fire engines provide other fire or accident reports. In the Netherlands, fire reels are inspected every year. These must be inspected for a number of requirements. Think, for example, that there is no cracks or rust corrosion in and around the hose or cabinet. And every 5 years the fire reels are subjected to a pressure test. So the fire hoses are very safe to use. In the Netherlands it is also required by law that fire hoses must be present in public buildings. 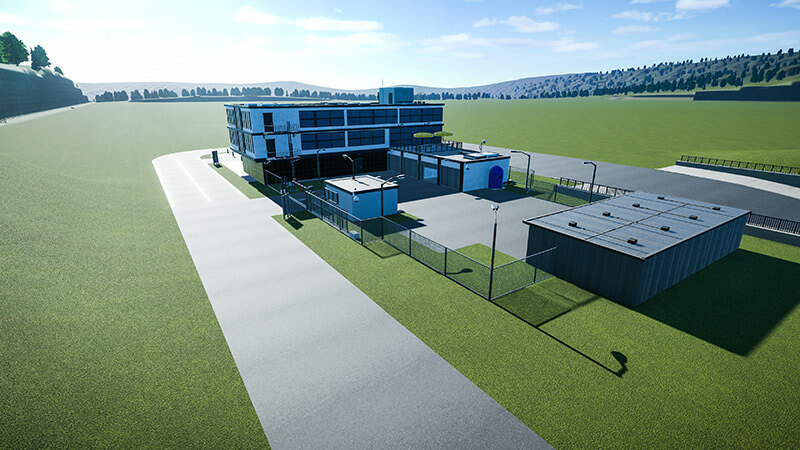 For example They must be connected to the drinking water supply of a building, They have a hose of at least 20 and a maximum of 30 meters, etc. Third Time!! I know nothing about it. This time not a lot of details in the photos. It’s now more of a rough construction phase. 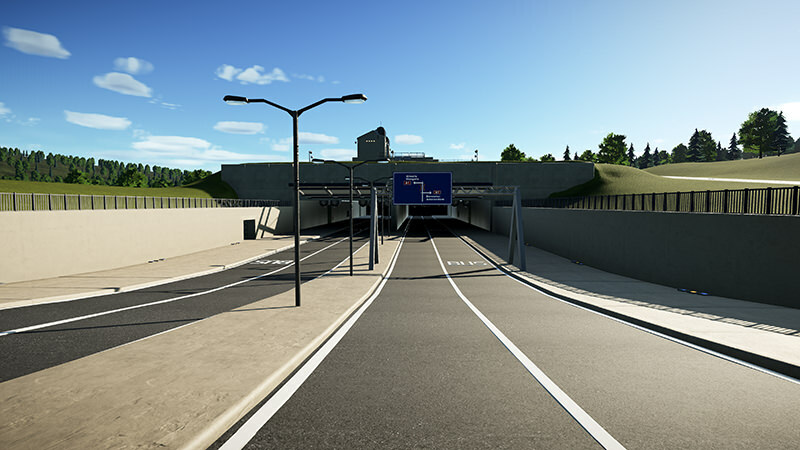 The tunnel cover. Unfortunately, the glass cannot be darker than it is now. 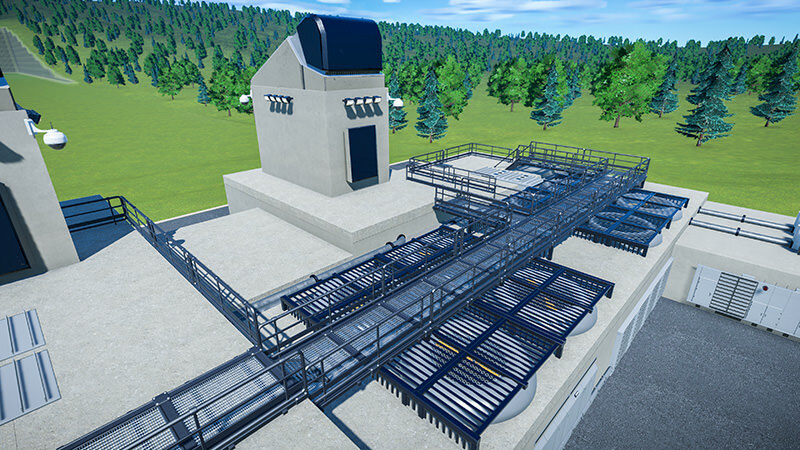 The front view of the Tunnel Ventilation System. At this moment it is one big concrete block. The two towers are the Tunnel Exhaust system. The tunnel has received ornamental lighting on both sides. The colors of the lighting can also be seen in the park logo. 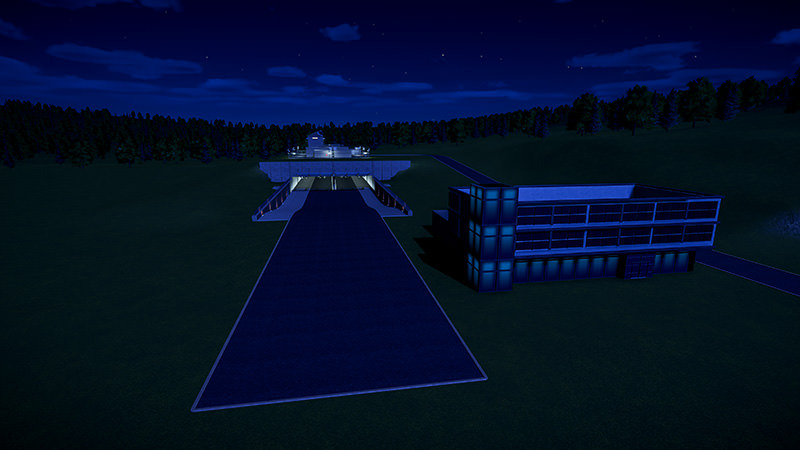 And an overview picture in the dark. The machine air vents are visible at the front. Excess heat can then be removed very quickly. Most of the time the heat is dissipated via the water. The water is then used for heating up nearby houses. The work bridge is also located over the fans. 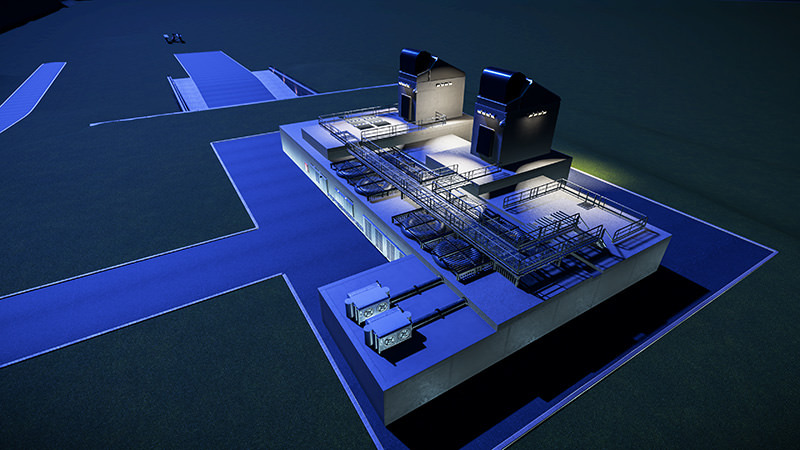 Pipelines are provided with a connection point, so that the water can be replaced occasionally. 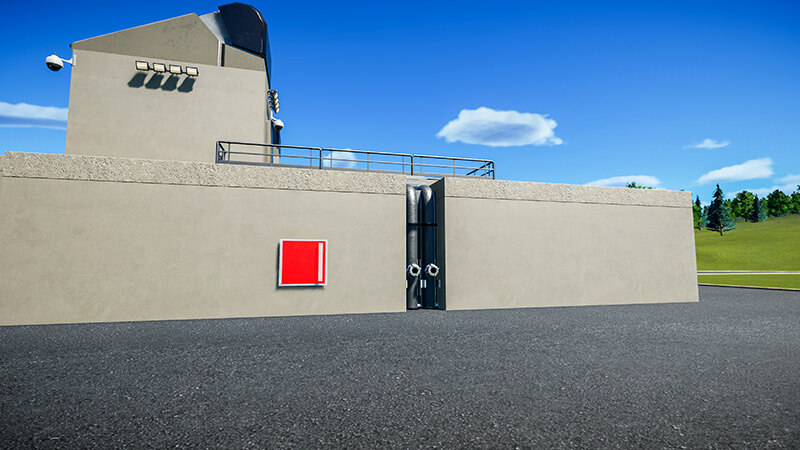 At the rear of the tunnel is the maintenance door of the tunnel ventilation system. Here is the machine room and control room. Security lights have been placed on the tunnel exhaust towers. 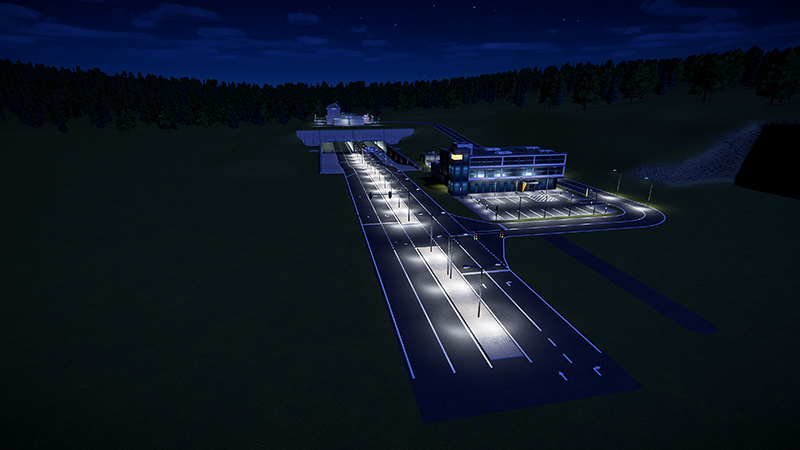 More lightings will be placed later, but this happens when I place the fences. Thank you, I have no idea what the theme is going to be. So I'm also curious about that. 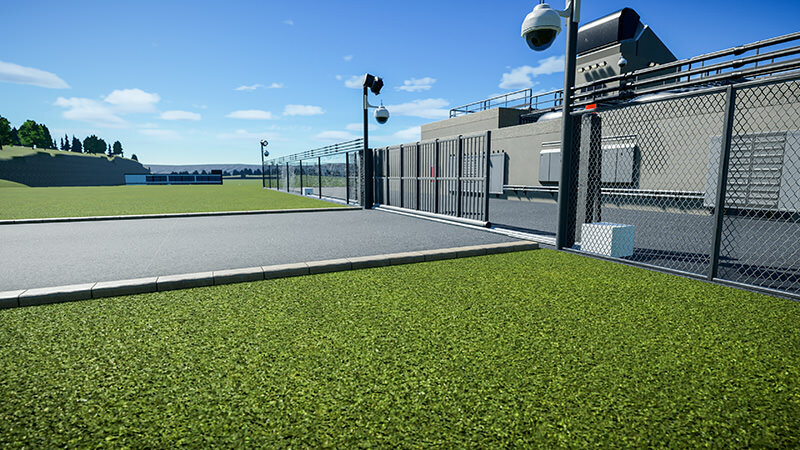 Fence around the tunnel ventilation system. 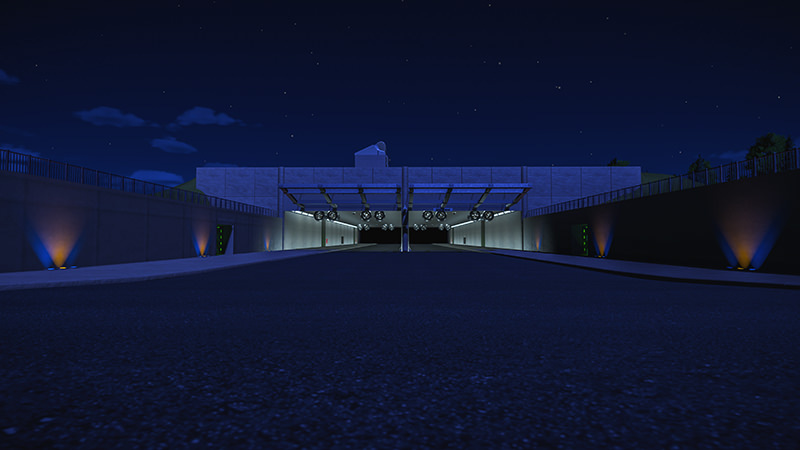 There are cameras with security lighting at all corners of the site. Photograph made of the entrance. A sliding gate has been made here. This can only be opened via the control room in the Road Maintenance Depot. 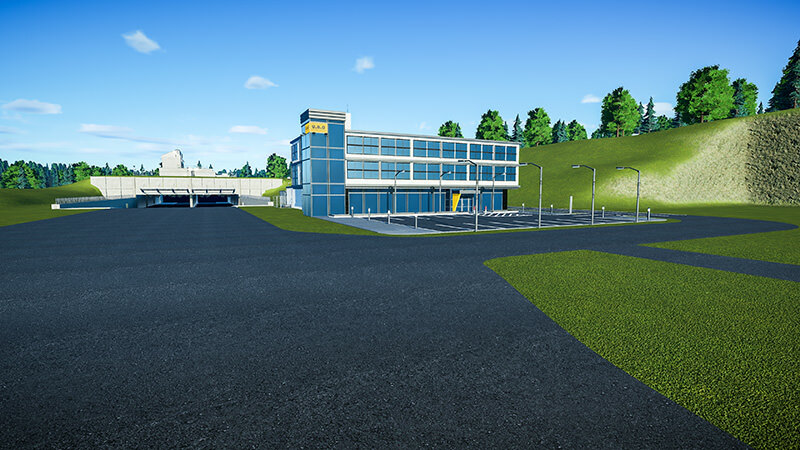 The office building for the Road Maintenance depot. 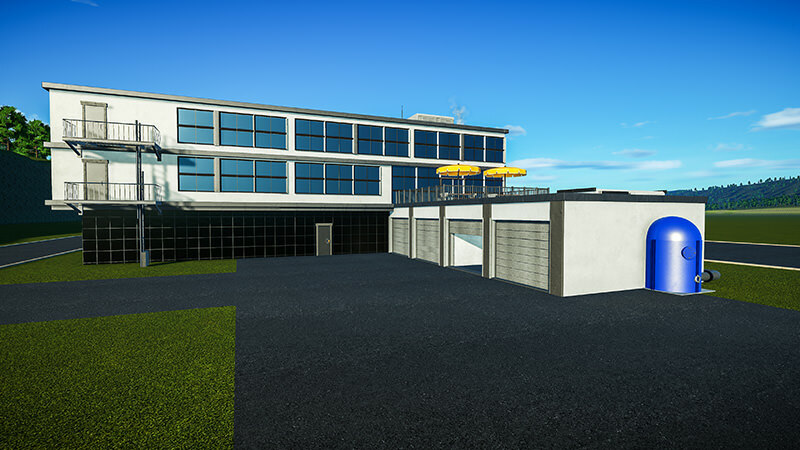 There will soon be more details on and around the building. The backside of the building. On the left side of the building comes the emergency stairs. The back of the building. On the left side of the building comes the emergency stairs. And the concrete block on the right side is for the garage’s. Night photo: I don't know if I really like the illuminated windows on the bottom or staircase tower. Your attention to detail and realism is astounding. I bet you've played a lot of SimCity and City Skylines. 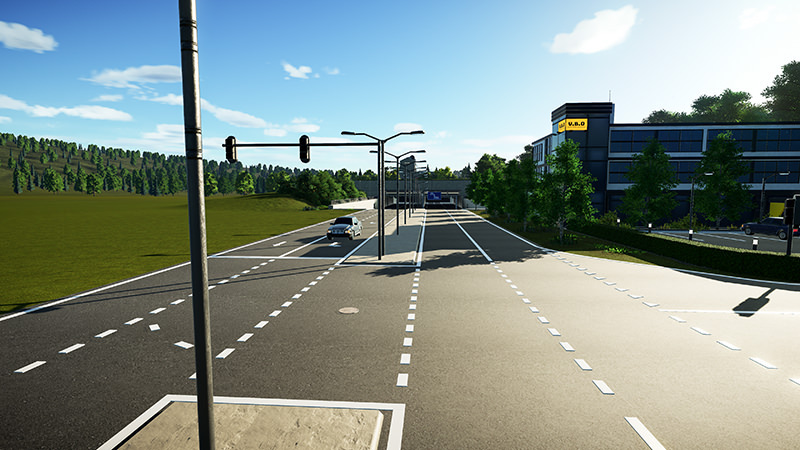 Thank you I have not played Cities Skylines very often. But I have grown up with the SimCity and the Roller Coaster Tycoon series. 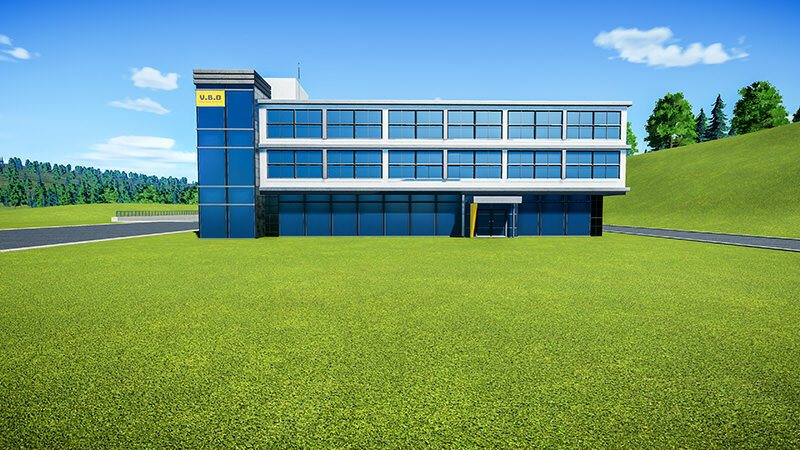 The front of the office building. De company name is located on the staircase-tower. 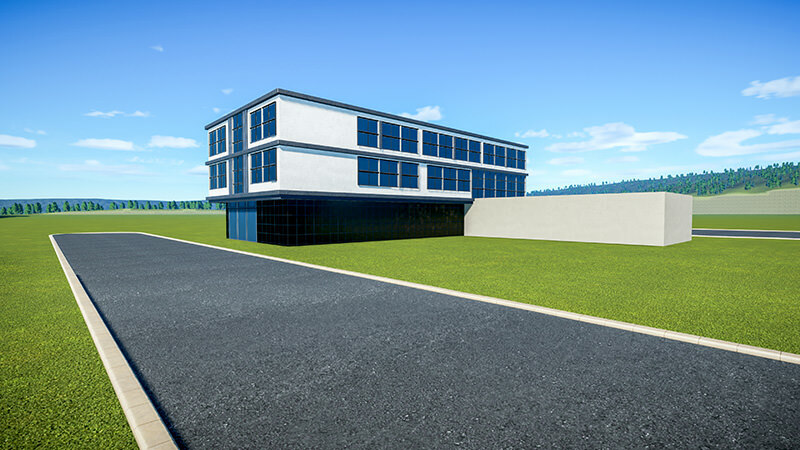 The back of the office building. 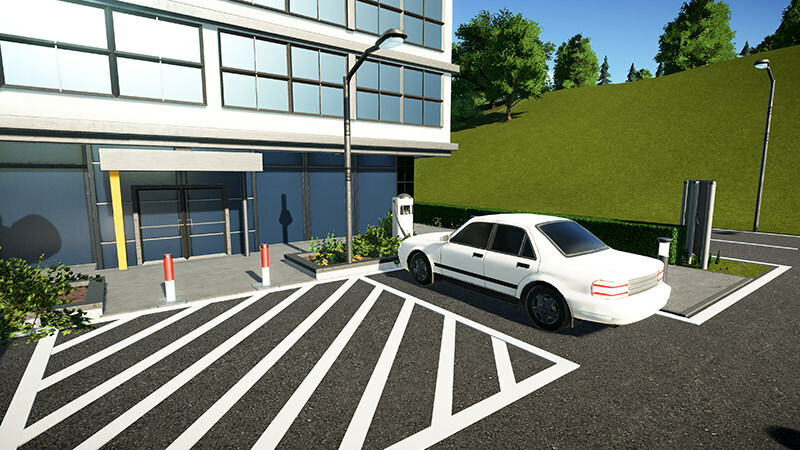 The garage boxes are meant for the street sweeper and maintenance of the vehicles. The blue silo has a special bio-cleaner for the street sweeper in it. 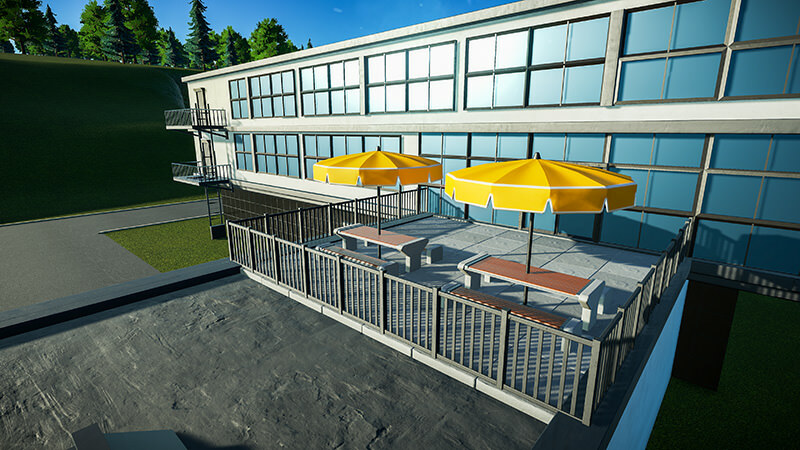 Terrace which is linked to the canteen. This is also the smoking erea for employees. 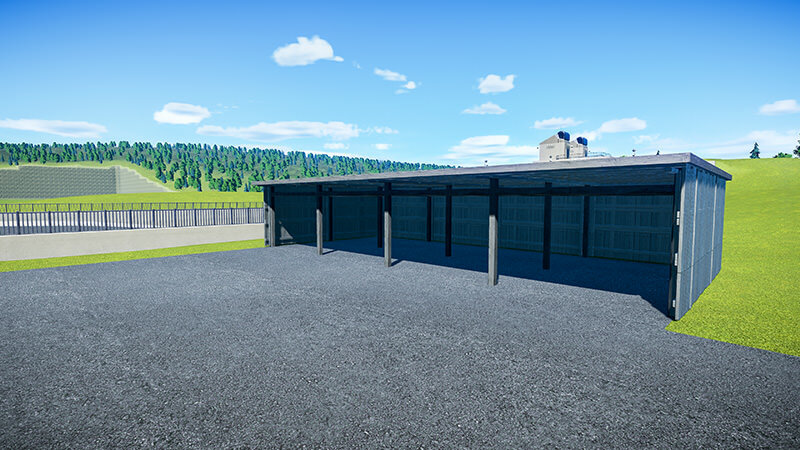 Carport for the maintenance vehicles. So that these vehicles are sheltered from the weather. 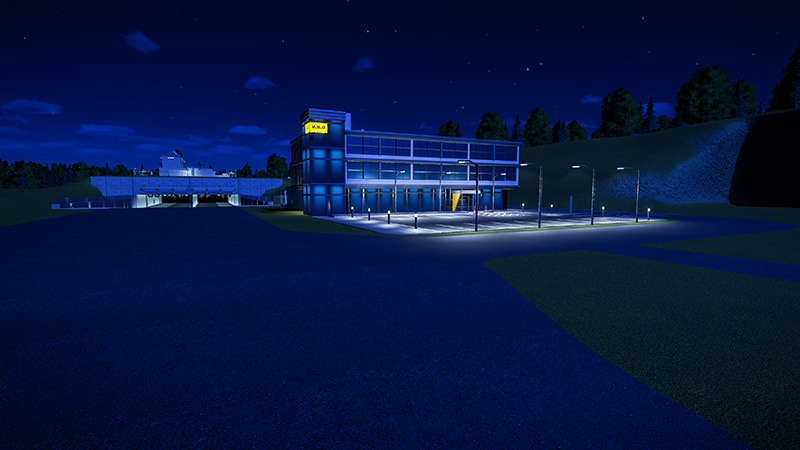 Night photo: There has not been much added to the lighting. That's what I call realism ! Really nice attention to the detail and to the "logic" with which real park backstages are designed. 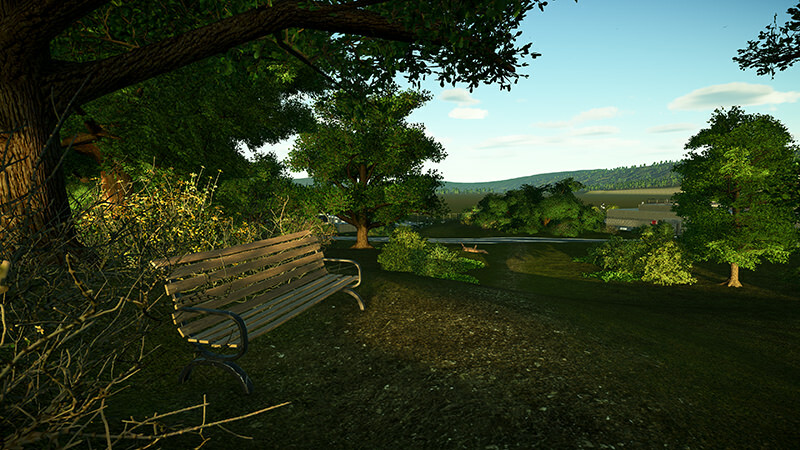 I think I'd be inspired by this park when I will create the resort map of WMW. 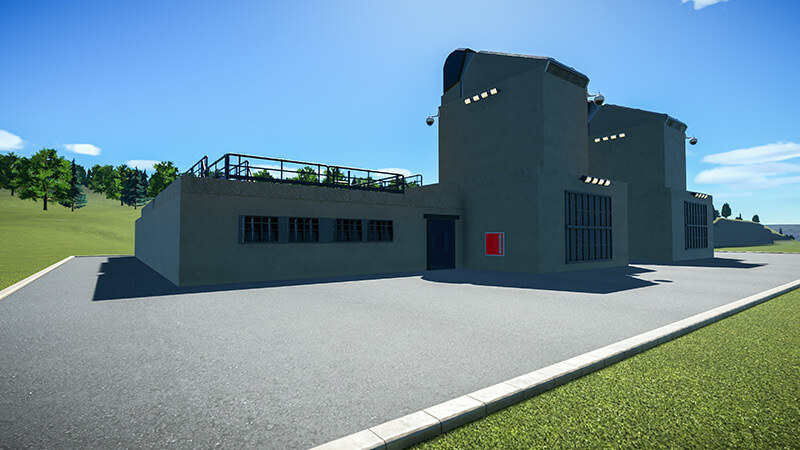 In this update, mainly I placed lighting. The Guests Parking lot in front of the office. 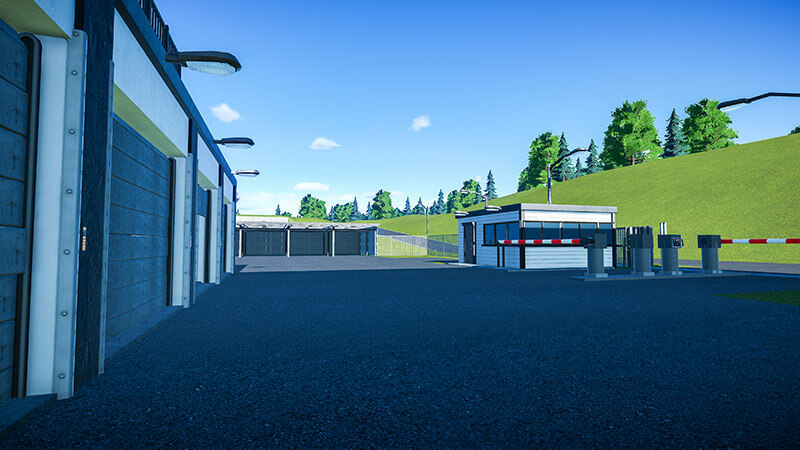 Photo of the maintenance area. Road Marking should only be applied. And here is another photo from the maintenance area. 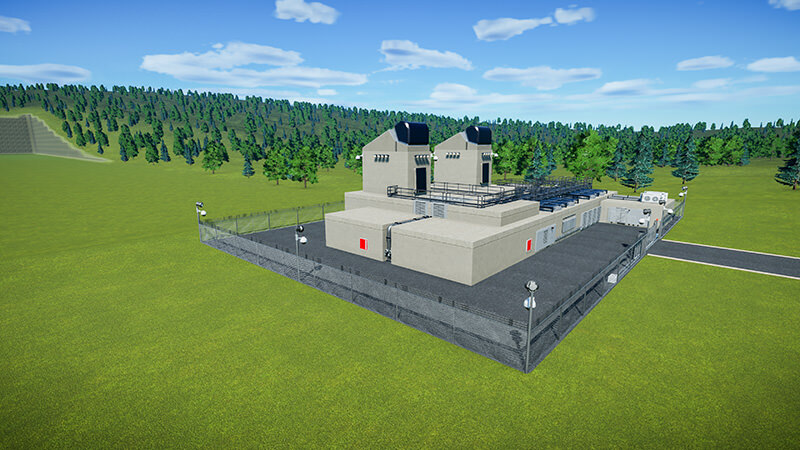 The security house with barriers can also be seen here. Road markings in the maintenance area. The asphalt area in the foreground is meant for pallets and other supplies. 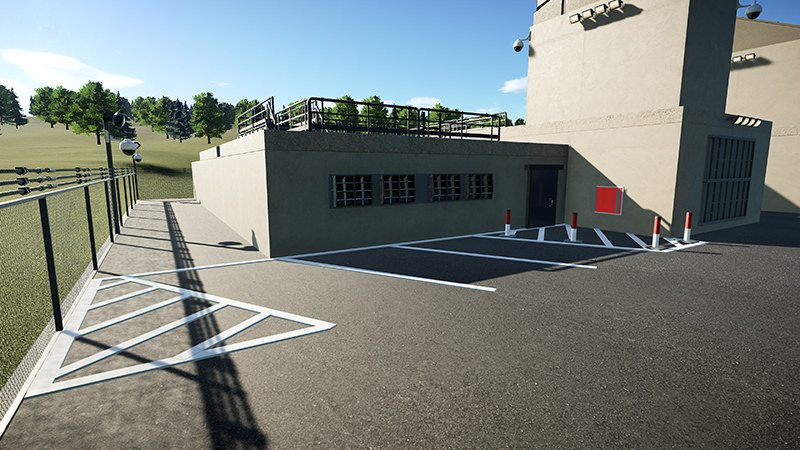 Parking spaces for the tunnel ventilation system. The intersection with traffic lights. I tried to trigger the traffic lights, but it didn't work exactly what I want. Road Markings in the tunnel. The Right line is only intended for buses and emergency vehicles. 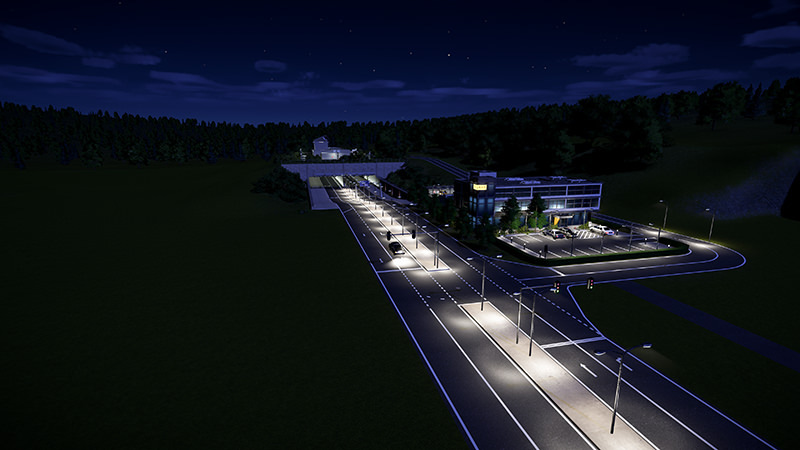 You can also see the signage that points towards the highway. Overview photo of the area. 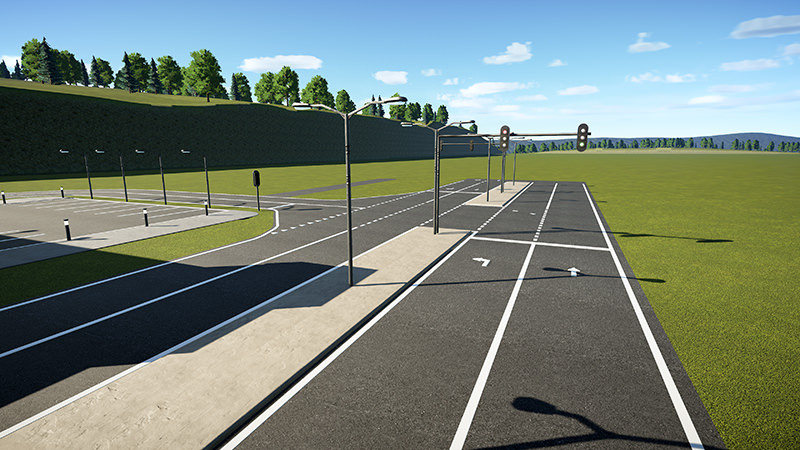 The streetlights for the tunnel and intersection. Photo taken from the tunnel. The trees along the road were planted by people themselves. The planting along the tunnel. I really enjoyed the difference in height on this photo. 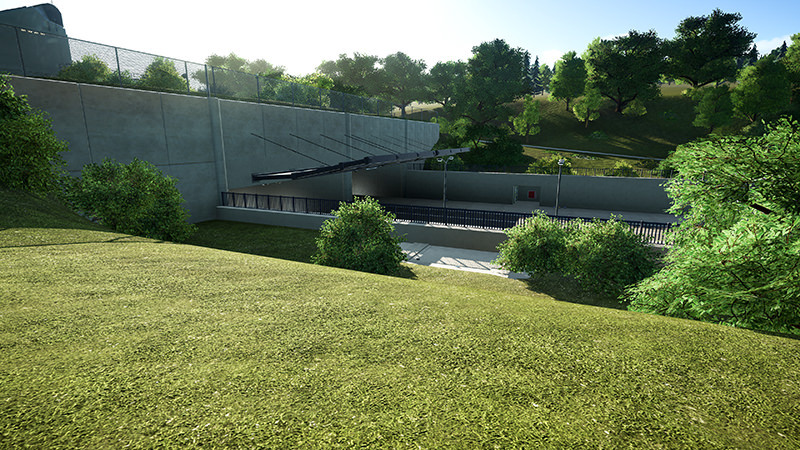 The fence above the tunnel is meant so that nobody can practice dangerous antics. The company cars of the Road Maintenance Depot. 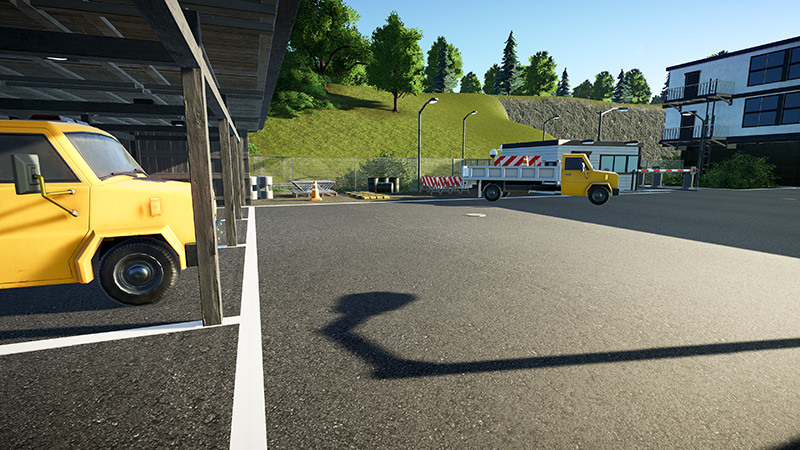 The company cars of the Road Maintenance Depot. 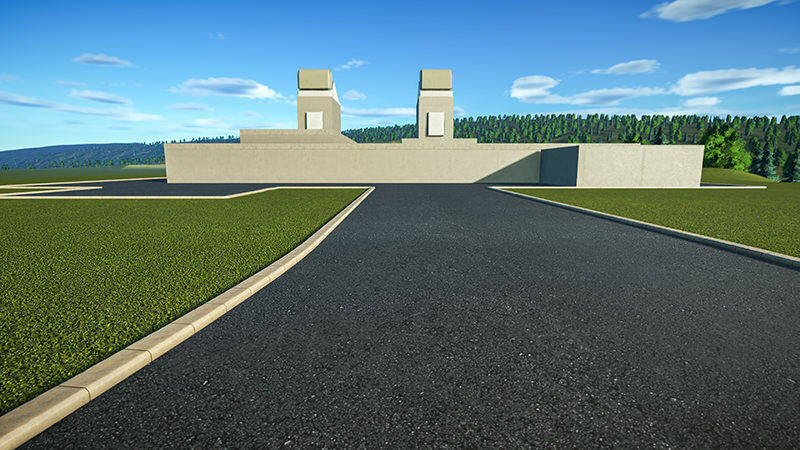 I miss the Semi-trailer truck in Planet Coaster. I have made a quiet spot in the forest. 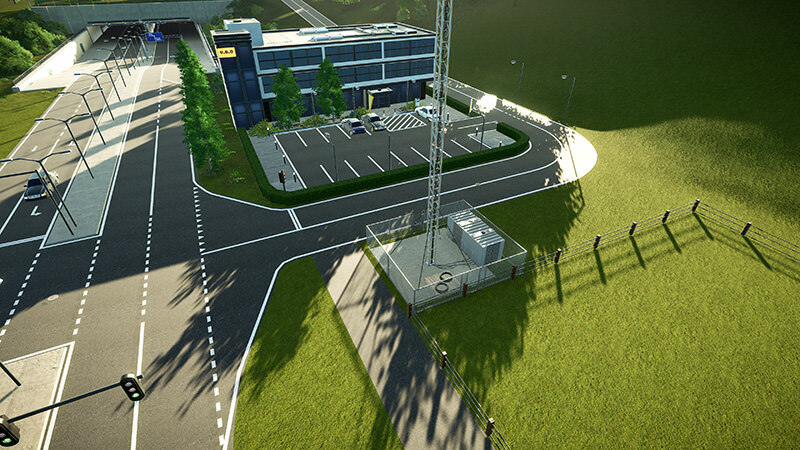 So that employees can also enjoy the nature during their breaks. Night photo. Nothing else has changed. I hope your computer will be able to handle this by the time you get to the park itself. Thanks, I appreciate that very much . 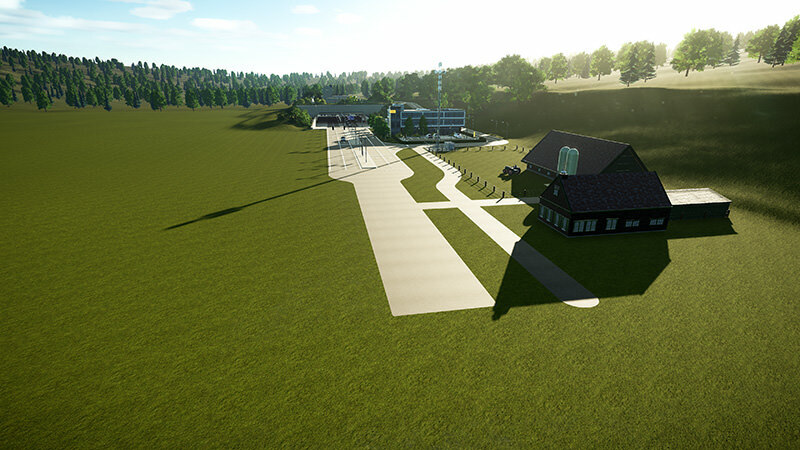 Up to now, my computer can run large parks. Only if I have to lower the resolution. I am currently playing the game at 4k. 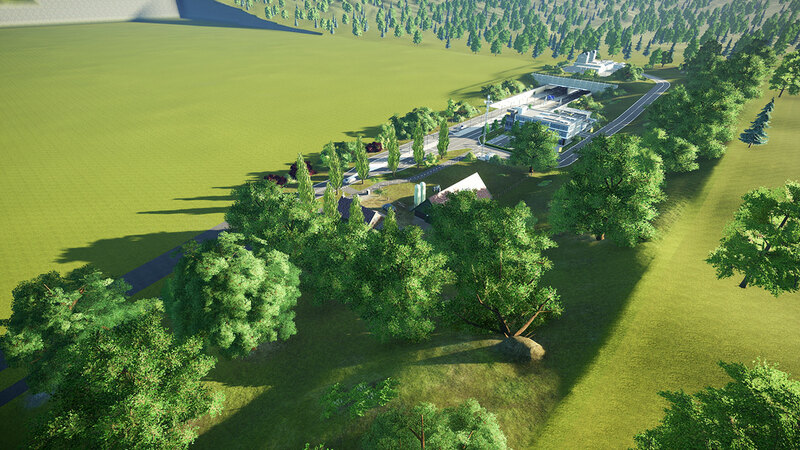 I'm also curious how my park will look like, at this moment I don't know what theme it will be. Hmmm, why not continue with the same sort of theme you're already doing? 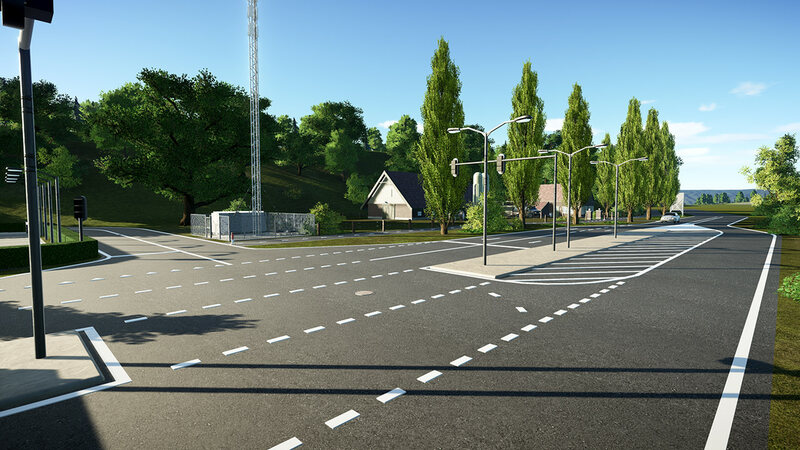 "Modern Dutch Parking Lot" is a very attractive style, as evidenced by all the favorable comments posted so far, and I can't imagine the road you've built already leading to something that looks completely different. 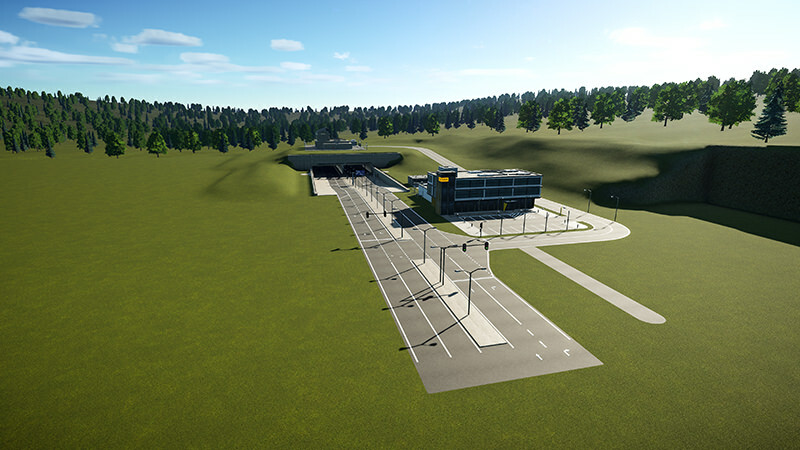 Everything I'm currently making is meant for public area. 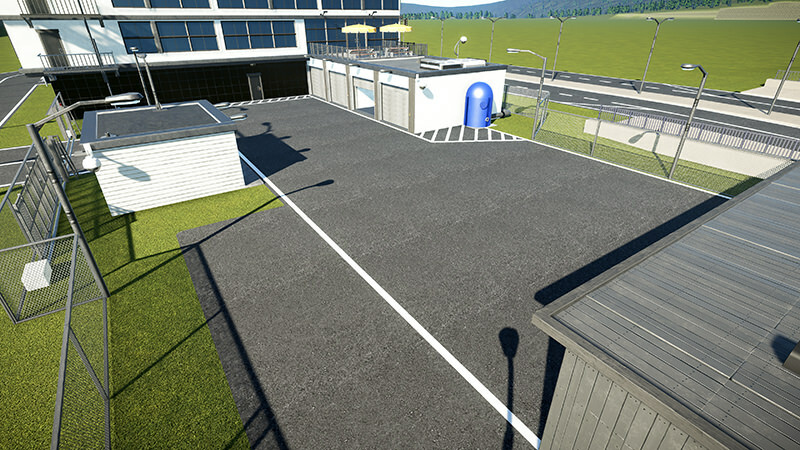 I already have a number of ideas that I will use for the public area. 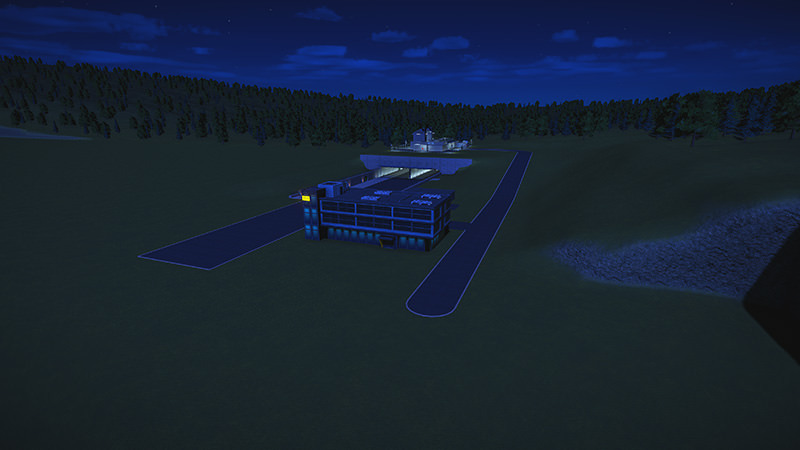 I don't know the Theming for the park yet. 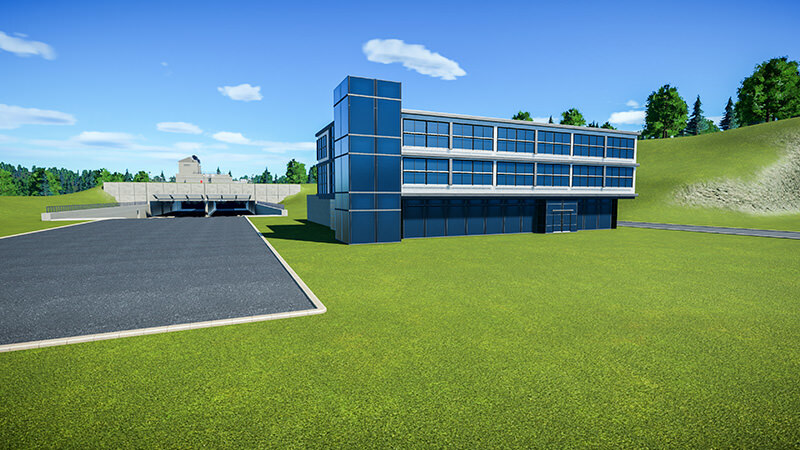 But there will certainly be a parking lot in the style of the park. UMTS, LTE Systems (3G and 4G network) and directional antenna are connected to the telephone mast. The directional antenna is used in rural areas. Because fiber optic cable is too expensive to install. This mast is 26 meters high. In this cabinet are the BTS (Base Transceiver Station) of the various providers in the Netherlands. 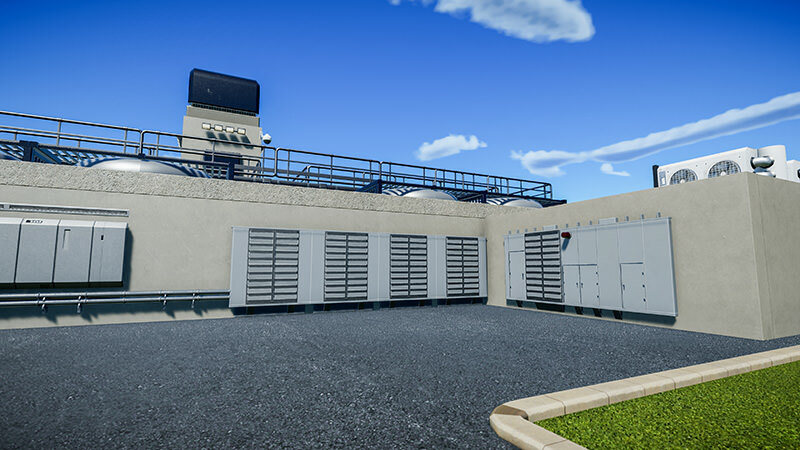 These cabinets provide control of the antennas and the forwarding / receiving of data. This is the last farm in the area around the resort. 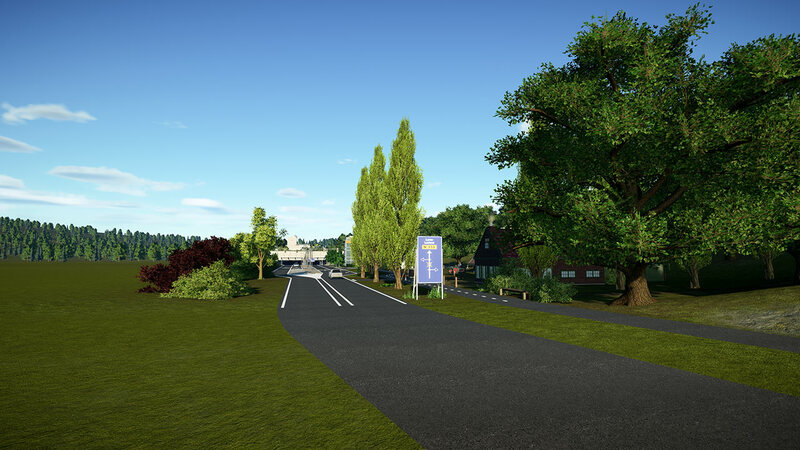 I want to show that the resort is located in a rural area, but also that there is development around the resort. Cows are staying in the barn. 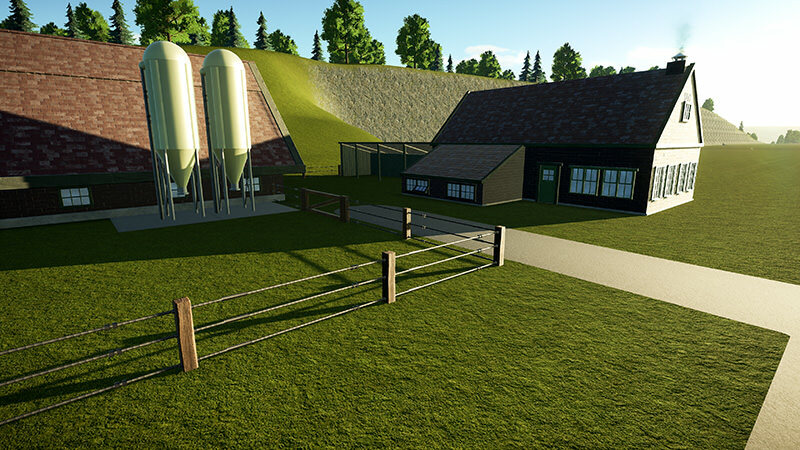 Food for the cows is in the two silos in front of the barn. Only the silos have to be increased slightly. 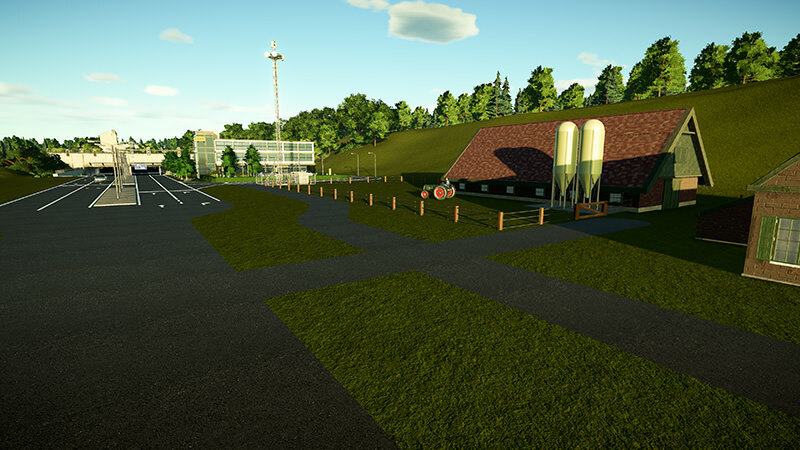 The tractor on the left comes from the steam workshop. This is made by Wings & Strings. I have only changed the color of this tractor. Overview photo of the area. The road on the right is a cycle path. 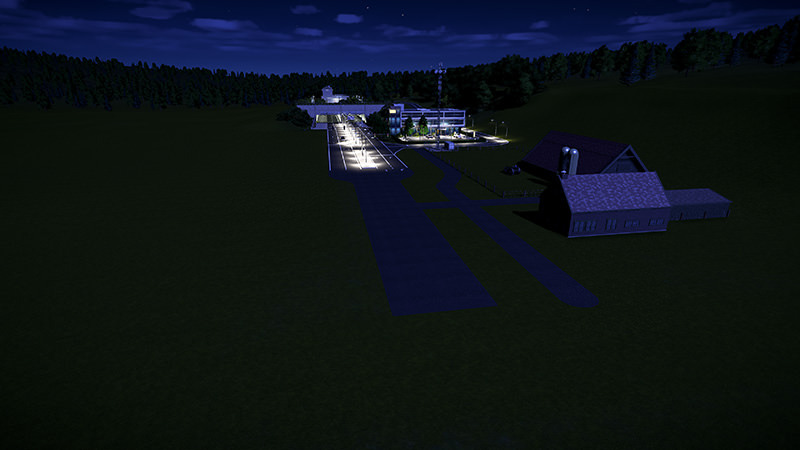 Night photo of the area. Unfortunately, the windows of the farm do not light up in the dark. 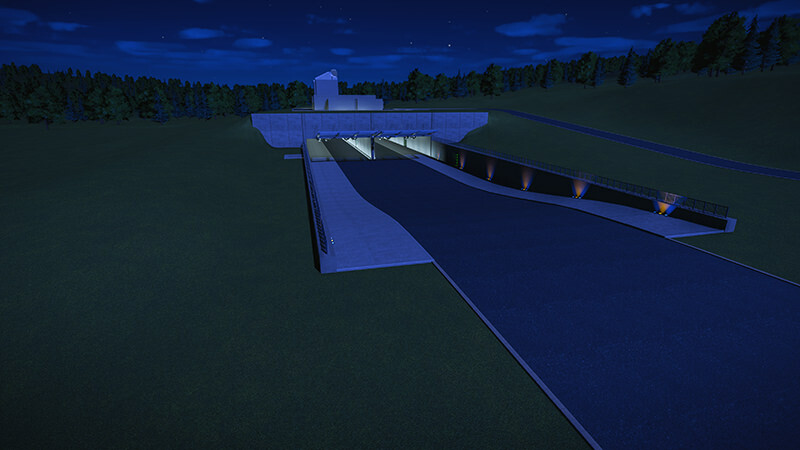 I hope that by placing lighting I can give the feeling that people live here. That's a great cell tower. Also, I'm quite envious of the directional ersatz-fiber antennae. I live in a rural part of the US and we don't have those. There is so much empty space with so few customers per square mile here that the number of towers required makes even that technology prohibitively expensive. Thus, US rednecks like me are forced to use satellite internet. While this has improved over time (it's now fast enough to allow streaming Netflix and such), the built-in lag precludes most multi-player gaming. Anyway, back on topic.... I don't see an aircraft warning light on the top of the cell tower. Should there be one? As for the farmhouse windows, it looks like you're using the "abandoned house" windows. If so, there are lit versions of those that look exactly the same but glow at night. Thank you . Here in the Netherlands it’s better arranged because it’s not a very large country. The largest provider in the Netherlands can therefore provide national coverage. In a technological era where you depend on the internet. I certainly understand the frustration that you can not make full use of the internet. But I also understand that the costs become too expensive, because the surface area of most States in America is larger than that of the Netherlands. I don’t know how the legislation around the aircraft warning light is in the Netherlands. Because I don’t see warning light on such towers. Even the church tower in my home town has no warning light. Only it is not the windows of the "abandoned house". The windows I use have a open shutter. But thanks for your help. I researched this just now . There's an International Civil Aviation Organization that develops standards on obstruction lighting (among other things), which pretty much everybody in the world adopts through their own aviation regulatory agencies (which is the FAA in the US). The ICAO rules only apply to structures taller than 200 feet / 61m. So if you're not that tall, you don't need a light. There are various light configurations for things taller than that. Here's a list of the rules (from the website of a maker of such lighting systems, to prove their products are compliant). Thank you for the information. 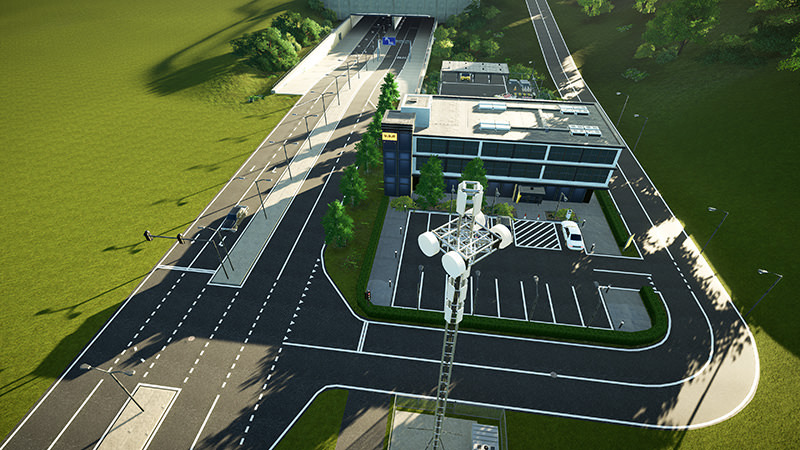 I am happy with my cell tower. It is true we have to take it into account when we build such buildings . 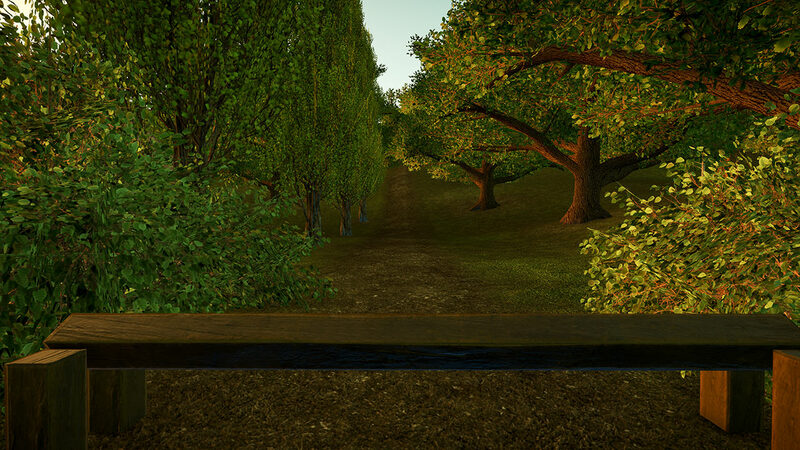 Here is a forest path, which goes towards the end of the map. At the end of the path I placed a fallen tree. In the foreground you can see the fallen tree. Just need to make a big hole so it seems that it has fallen down. 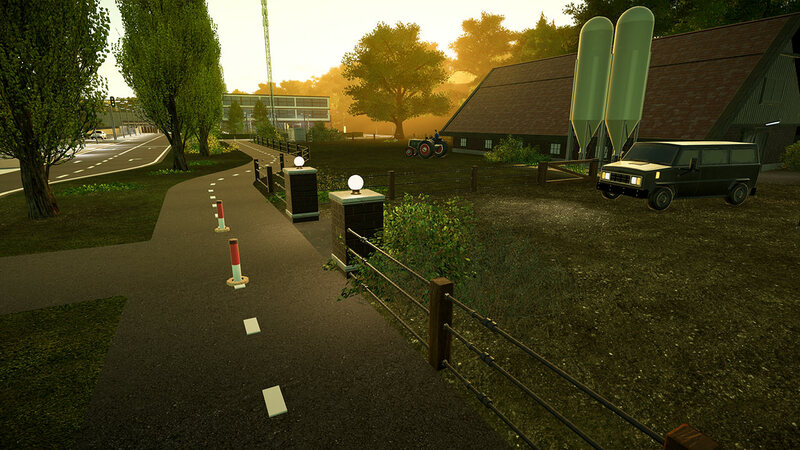 The bike path that runs along the farm. Apparently the farmer has little inclination to work because he is constantly looking forward on his tractor. This is the only lighting on the barn. 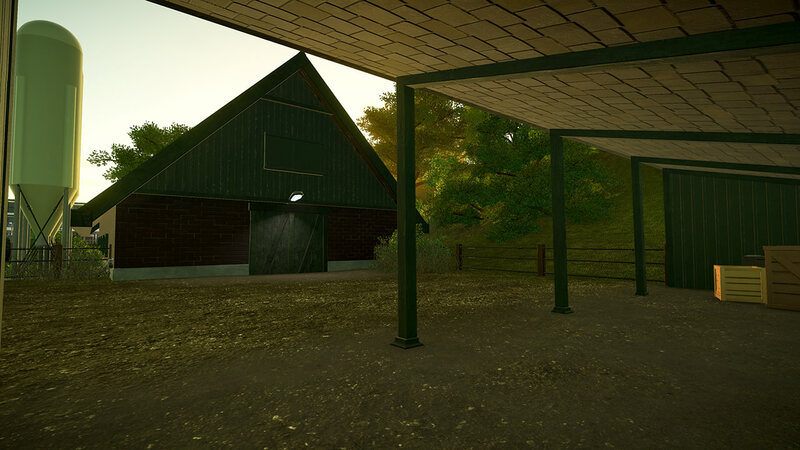 At night it makes this part of the farm dark and with one light a bit of a scary location. (Also on the other side of the barn). Photo taken from the side of the tunnel. The road marking has also been further updated. As you can see you can only drive over one road section. A signage has also been placed. This is different than at the tunnel. And on the right the farm is nicely hidden behind the trees. 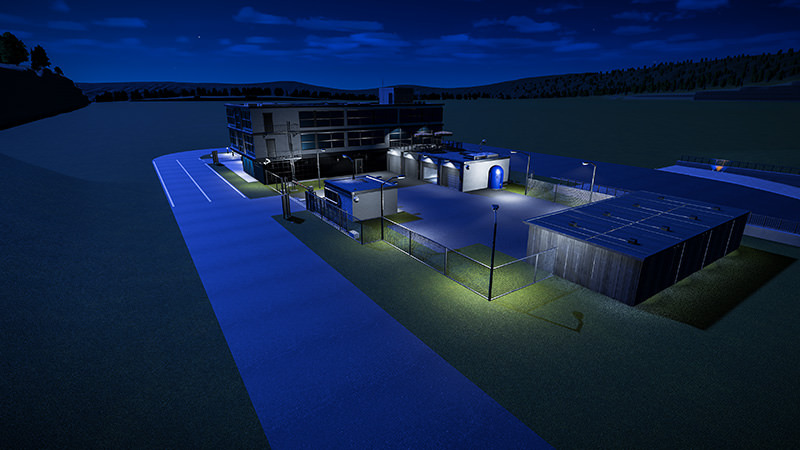 Night picture of the environment. I find it a beautiful sight that the tunnel is well lit and the farm on a unlit road. On the right you see a small light on the farm, so it looks like someone is present on the farm.